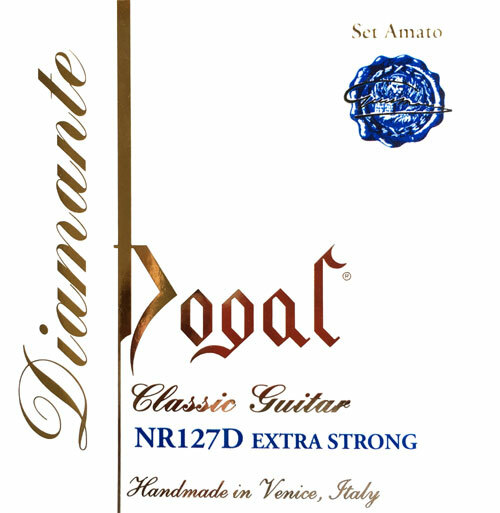 Based in Italy, Dogal has been making fine quality guitar strings since the 1960s. The innovative Diamante strings feature carbon fiber in addition to the traditional nylon, and the basses add kevlar and carbon fiber to the traditional nylon in the multi-strand core. This results in a string that is bright, durable, sustaining, harmonically rich, with a well-defined foundation and an excellent stability of tuning. Try these excellent classical guitar strings today! These strings have a very beautiful, warm, and round tone. The overall balance of the set is outstanding. The diameter of these trebles is almost perfect and every string feels so great under the fingers. However, the disadvantage of this new nylon/carbon mix is that these trebles have a slightly slower response than of a traditional nylon or carbon string. In that respect, they are similar to Savarez "New Cristal" line. Also, these trebles tend to shred and do not keep the tuning well. They particularly needed a constant tuning adjustments, what was very disappointing in a concert situation. This is a rare example of everything the manufacturer says being true: powerful, complex sound ("rich overtones and a strong fundamental") and outstanding sustain, that respond equally well across my guitars' full dynamic and tonal spectrum, whether the style is aggressive, flamenco-inspired figures, chunky jazz voicings or Towneresque techniques with extended chord-melody interactions built around one or more open strings. The maker is also correct about the exceptionally quick setup time. Even in the perpetually humid environment my guitars live in, the strings stabilize within a couple of hours rather than days (or weeks). As a longtime SBM customer, I'm very glad that these strings are available here. Nothing else I've ever used -- which includes just about every brand out there -- even comes close.